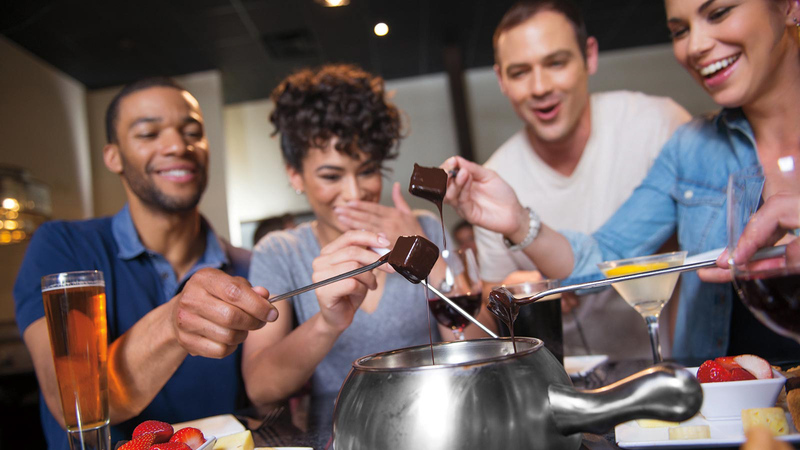 Welcome to the Melting Pot, where friends come together over fondue to create lifelong memories. No matter how many are in your party, we can accommodate your every dining need at The Melting Pot. From small groups looking to celebrate something special to large crowds in the mood to party, there is always a table for you at our gourmet fondue restaurant. Create your night the right way and make a few memories over our handcrafted cocktails, customizable fondue entrées, and wonderful chocolate desserts. As a yearly recipient of Wine Spectator's Award of Excellence and one of the "Top 10 Most Romantic" restaurants in the Atlanta area, The Melting Pot is perfect for date night. Celebrate a special anniversary with the one you love or simple join us for fondue because you feel like enjoying each other's company over a bubbling pot of deliciousness. Forgot your Valentine? We've got you covered! Can't make a date to dip with us on Valentine's Day? Not to worry – The Melting Pot is still able to fulfill all of your Valentine's gifting needs throughout February and create the perfect night out for your valentine! Surprise your sweetheart with our “I Love You” package, a deluxe fondue experience featuring everything you need for an ultimate romantic evening! To order the “I Love You” package, priced at just $75, call your preferred Atlanta-area location at least 24-hours in advance before your desired pick-up time. Hurry – this offer is very limited and is only available now until Feb. 18! Perfect Gifts to "WOW" Her! After all she's done for you, doesn't Mom deserve something special, especially on the day devoted to her? Click here to view all of our gift ideas! Give mom the day off and treat her to an extraordinary Mother's Day, all-inclusive family experience at The Melting Pot! On Saturday, May 13 and Sunday, May 14 a family of four* can dine for $159* with our "Mom Dream Day Package"! Each guest will enjoy our creamy cheese fondue, "Mother's Best" entrée and our decadent chocolate fondue PLUS surprise Mom with a bouquet of fresh spring flowers, three (3) of our Signature Chocolate-Covered Strawberries and a souvenir photo for only $159* per family of four. What makes this deal even sweeter? When you purchase this package, Mom will be automatically entered to win a pampering prize package! All proceeds go to Children's Healthcare of Atlanta. Winners will be announced on our Facebook page Tuesday, May 16, 2017. See store for complete details . *Valid only Saturday, May 13 and Sunday, May 14. Priced and portioned per person. Parties larger than 4, Mom Dream Package is priced at $37 for additional persons No sharing. Not valid with any other offer, discount, promo, certificate, bonus certificate or coupon. No substitutions. See store for additional details and restrictions. An assortment of seasonal flowers in a vase and a box of three (3) Signature Chocolate-Covered Strawberries. Includes a souvenir photo. An assortment of seasonal flowers in a vase, a bouquet of latex balloons attached to a box of three (3) Signature Chocolate-Covered Strawberries. Includes a souvenir photo. One (1) exclusive Melting Pot Cookbook, one (1) bottle of Garlic & Wine Seasoning and one (1) box of chocolate wafers. To order yours today, simply call 770-425-1411 to speak with our Hospitality Specialist! Packages and pricing are valid only May 12 - May 15. All flowers are assorted. Some requests of rose color and flower variety may not be available. Enhance your dining experience with one of our Celebration Packages! Let us help you make your special day perfect! Simply ask our Hospitality Specialist or Manager for more information. Let us help you make your special day perfect! Simply let our Hospitality Specialist know which package you would like and we will have it waiting on the table when you arrive! One Melting Pot Mylar balloon surrounded with three balloons attached to our signature chocolate fondue wafers. Includes a souvenir photo. Our signature chocolate fondue wafers, half-dozen roses with assorted flowers in a vase. Includes a souvenir photo. Our signature chocolate fondue wafers, celebration balloons, half-dozen roses with assorted flowers in a vase. Includes a souvenir photo. Ignite the flame with our exclusive “Design Your Dream Dinner” Ultimate Romance package. The package includes priority seating at our most romantic table, any four-course dinner for two, half dozen roses with seasonal flowers, six Signature Chocolate-Covered Strawberries and a Champagne toast with flutes. Our Signature Chocolate-Covered Strawberries are available in boxes of three, six or twelve. These decadent treats make the perfect gift for any occasion. Perfect for anniversaries, proposals or just because! Surprise that special someone with a little romance. Choose from any our Romance Packages and make their evening a little more special. Click here to details! Rose petals sprinkled across your table, a singe rose with tea light candles. Rose petals sprinkled across your table, 3 roses in a vase, Champagne toast with souvenir Melting Pot logo flutes, and tea light candles. A half dozen roses with seasonal flowers in a vase and a box of our signature chocolate fondue wafers. Includes a souvenir photo. A half dozen roses with seasonal flowers in a vase with an assortment of latex balloons attached to a box of our signature chocolate fondue wafers. Includes a souvenir photo. For more rose and flower options, click here or simply call our Hospitality Specialist. Make your special someone's perfect night out even more memorable with any of our flower options. All of our bouquets are crafted daily by our Hospitality Specialist. Click here for all of our options. An assortment of seasonal flowers in a vase and a box of our signature chocolate fondue wafers. Includes a souvenir photo. An assortment of seasonal flowers in a vase, a bouquet of latex balloons attached to a box of our signature chocolate fondue wafers. Includes a souvenir photo. Enhance your dining experience with one of our Balloon & Flower Celebration Packages! Perfect for birthdays and graduations. Click to view all of our packages or simply ask our Hospitality Specialist or Manager for more information. A bouquet of latex balloons attached to a box of our signature chocolate fondue wafers. Includes a souvenir photo. Pop open some bubbly to any occasion! Call our Hospitality Specialist to add on one of our wine packages*. Click here for options and details. *Must call before 3 p.m. to place order. One split of Zonin Prosecco, two souvenir Melting Pot logo flutes and three Signature Chocolate-Covered Strawberries. One bottle of Chateau Ste. Michelle Brut, two souvenir Melting Pot logo flutes and three Signature Chocolate-Covered Strawberries. One bottle of Moet & Chandon "Imperial", two souvenir Melting Pot logo flutes and six Signature Chocolate-Covered Strawberries. Celebrate her special day with us! We have a variety of packages for her special day. Click here for more details. Includes cheese fondue, entrée and chocolate fondue. Entrée includes: Teriyaki-marinated Sirloin, Filet Mignon, White Shrimp and Breast of Chicken. Plus a commemorative souvenir group photo, box of our signature chocolate fondue wafers, birthday sash and a tiara for the guest of honor. Includes cheese fondue, entrée and chocolate fondue. Entrée includes: Teriyaki-marinated Sirloin, Filet Mignon, White Shrimp and Breast of Chicken. Also includes a Champagne toast for each guest. Plus a commemorative souvenir group photo, box of our signature chocolate fondue wafers, bridal sash and a tiara for the guest of honor.